The last thing that most people want to deal with when they have a flight scheduled is bad weather. Vacations, business meetings, and other important events await on the other side of flights. If you’re prepared, you can minimize delays due to bad weather get where you need to go without many complications. When you book your flight, try to get one that leaves in the morning. Early flights are less likely to be cancelled or delayed than flights scheduled in the evening. Logistically, the effects of bad weather accumulate as the day passes on. Flight delays and cancellations seem to have a domino effect. More and more planes don’t leave – or arrive – on time. As the day goes on, an increasing number of airplanes have to be pushed to the back of the line – for takeoff and landing. Anytime you book a connection, it’s a good idea to leave at least an hour in between flights. If you know you’ll be flying out of – or into – a city that’s known for bad weather during a certain time of year, you’ll be best served leaving 2 hours in between. Before you leave for the airport (ideally, days before), check the weather forecast to get an idea of how much time you’ll need for traveling to the airport. Checking the weather forecast will also clue you in on whether you should be contacting the airline to request an earlier flight (which could make all the difference in getting to where you need to go). If weather in your arrival city is bad, the airline’s entire schedule is probably going to be off. So, remember to check the forecast in your home city as well as where you’re going. A ripple effect tends to occur when there’s extreme weather anywhere. 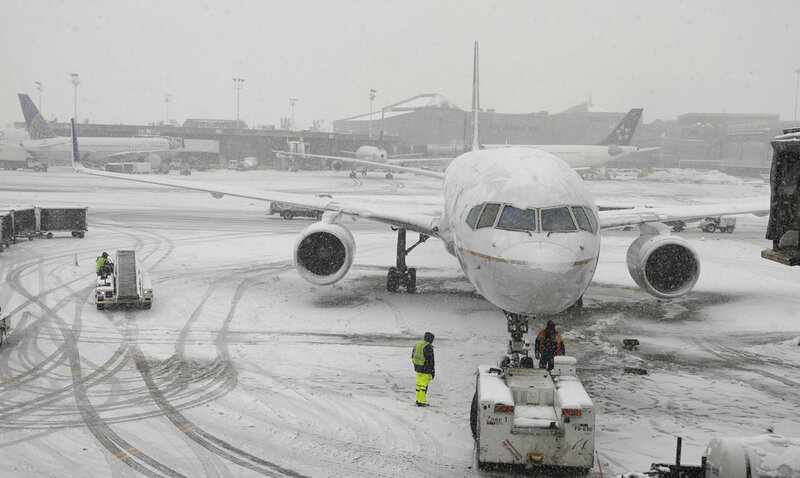 If you learn about bad weather in a major airline hub, call your carrier to see if there is anything they can do to help you avoid cancellation or delay. It’s safe to say that if the weather is bad in your departure or arrival city, the flight schedule in your connecting city will likely be a mess too. Again, call your airline ahead of time and ask them if you can reroute your connection flight through airports that are far from any inclement weather. When you have an upcoming flight, you can typically get information on any potential delays or cancellations by calling the airline often or checking its website. Airlines usually update flight status last minute, posting official delays only when they’re sure they’ll happen. Keep this in mind; because even when an airline tells you the plane will be on time, this may not be the case 20 minutes later. The departure screens at the airport will keep you updated on any delay or cancellations that are certain to occur. If you notice a delay or cancellation, it’s time to talk with a representative of your airline to rebook or get other assistance. Even if you’re at the airport already and need assistance with a delayed or cancelled flight, you can call the airline’s 800 number for help. Standing in line with everyone else to get information on delayed – or cancelled flights – will likely add to any wait you’re already going to experience. Get your cell phone out if you have one (or run to the house phones when you notice the delay) and call to find out what your airline can do to assist you. Sometimes, people on cancelled or delayed flights have found help through social media channels like Facebook and Twitter. If you suspect – or confirm – bad weather flights in your near future, stay close to the gates so that you can hear any important announcements. Airline personnel with often update you on your flight’s status, alternative flight options, and offers for lodging if your stay at the airport is going to be a long one. If you have confirmed accommodation reservations in your destination city, you may need to call the hotel and ask them to make changes in your arrival time – or check-in date. Also, quickly get on the phone to book nearby accommodations if your outbound flight will be delayed overnight. Everyone else with pushed-back – or cancelled flights – will probably be doing the same thing. Depending on where you are, you might have to act fast to get a room. These tips to navigating flights in severe weather will help you eventually get where you need to go.